Apr. 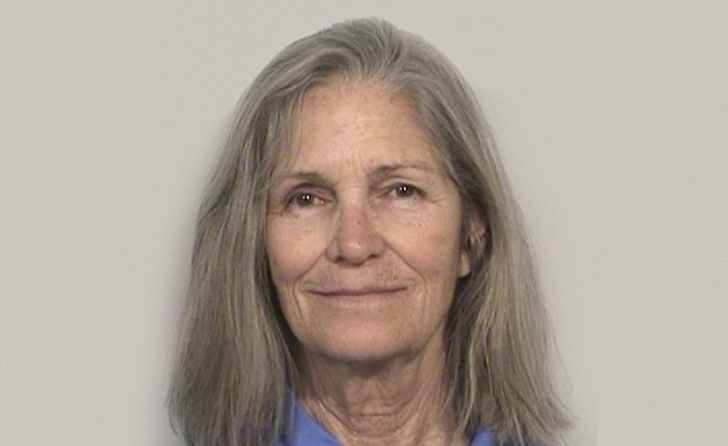 14 – Leslie Van Houten has been found suitable for parole at her 20th hearing, held today at the California Institute for Women in Corona, California. Van Houten was retried in 1977, which resulted in a hung jury. She was retried the following year and again convicted, this time sentenced to life with the possibility of parole. Because of time served on her original sentence, Van Houten was already eligible for parole when she returned to prison in August of 1978. Since then, she has been denied parole 19 times. Her last hearing was in June of 2013 and she was given a five year denial. In September of 2015, she filed a petition to advance her hearing date citing self-help programs and other work she had done to address the board’s concerns. The decision will undergo a 120-day review by the Board of Parole Hearings. Then it will be reviewed by Governor Jerry Brown, who will have from August 12th to September 11th to either confirm, reverse or modify the parole grant. SERGEANT McGANN:	(Unintelligible) we’ve got all kinds of goodies (Unintelligible) we’ve got all kinds of goodies (Unintelligible) Leslie, is your last name Sankston? Is that your true name? SERGEANT McGANN:	What other names have you used? MISS VAN HOUTEN:	Ah — the last one was Louella Alexandria. SERGEANT McGANN:	It was — it was a few, huh? MISS VAN HOUTEN:	Every arrest (Unintelligible) different ones. SERGEANT McGANN:	Right now, you’re going under the name of Leslie L-e-s-l-i-e? MISS VAN HOUTEN:	–l-i-e. Uh-huh. Marie Sankston. MISS VAN HOUTEN:	Yes. – –k-s-t-o-n. SERGEANT McGANN:	And that is your true name? MISS VAN HOUTEN:	Yeah. Umhum. Well, what’s the other names, now, you’ve used? SERGEANT McGANN:	Ah — That’s the last name? SERGEANT McGANN:	What’s the first name you used with that one? MISS VAN HOUTEN:	— -l-l-a. MISS VAN HOUTEN:	Uh-huh — Alexandria. SERGEANT McGANN:	And any others? MISS VAN HOUTEN:	Yeah, Louise Susan Alexandria. MISS VAN HOUTEN:	– –a-n. S-u-s-a-n. Susan. SERGEANT McGANN:	You like that Alexander, huh? MISS VAN HOUTEN:	It just kept popping in my mind. SERGEANT McGANN:	Anything else? Any others? But, I don’t know if it was Leslie or Linda. It might have been Linda, Linda Owens. MISS VAN HOUTEN:	That was (Unintelligible) yes. Well, that was during the Spahn’s Ranch raid. SERGEANT McGANN:	That’s the name you used when you were arrested up there at Spahn, huh? MISS VAN HOUTEN:	No, not that I can think of. SERGEANT McGANN:	Do you use Leslie? SERGEANT McGANN:	— name they call you (Unintelligible) people normally at the Ranch? But, more towards the end, I was Lou. But, a lot of the times, I was Leslie. SERGEANT McGANN:	That’s just L-e-s-l-i-e? MISS VAN HOUTEN:	Yeah, just Leslie. SERGEANT McGANN:	Just Leslie, huh? MISS VAN HOUTEN:	My regular old name. SERGEANT McGANN:	Let’s see, that would be — At the first, that’ d be the Spahn Ranch and Barker and, then, later, they called you Lou? Just a few of the girls called me Lou or LuLu. I’m Sergeant McGann from Homicide, L.A.P.D. SERGEANT McGANN:	And I’m here to talk to you mainly about some crimes that were committed by the group that you ran with. SERGEANT McGANN:	— pretty good information from people that have been talking. SERGEANT McGANN:	And I’m just kind of laying my cards on the table, so you’ll know that I — I do know some of the things that happened up there. And, naturally, I don’t know every detail and that’s why I’m here to talk to you. SERGEANT McGANN:	You know of this? SERGEANT McGANN:	— you still can’t be prosecuted. MISS VAN HOUTEN:	My lawyer went into the details. SERGEANT McGANN:	He went into details. But, then, again, we need — we need someone that — to fill in the spaces that we don’t know about. So, we might start out as when you first got to the Spahn Ranch. When did you first go up there? MISS VAN HOUTEN:	About — This is — this is where it gets rough, trying to remember. Probably about a year ago this Fall. SERGEANT McGANN:	A year ago this Fall. MISS VAN HOUTEN:	Yeah, about a year ago. SERGEANT McGANN:	Be about — ah — November of ’68, then? MISS VAN HOUTEN:	About — about then. SERGEANT McGANN:	About then, huh? What made you go up there — ah — Leslie? MISS VAN HOUTEN:	Ah — I just happened to hear about it, so I went on up. Where — where did you live when you heard about it? MISS VAN HOUTEN:	San Francisco. SERGEANT McGANN:	— alone, or who were you living with? MISS VAN HOUTEN:	A girl. SERGEANT McGANN:	A girl friend? But, I haven’t seen her since. I was living with her and her husband. SERGEANT McGANN:	And how old a girl was she? MISS VAN HOUTEN:	Oh, I’d say she must have been about twenty-two or twenty-three. SERGEANT McGANN:	And then, how — how about her husband? MISS VAN HOUTEN:	(Unintelligible) around twenty-five or twenty-six. What was her — What were their names, the people you lived with up there? MISS VAN HOUTEN:	Her name was Dee. SERGEANT McGANN:	“D” double “E”? MISS VAN HOUTEN:	I think so, yeah. SERGEANT McGANN:	What was her last name? MISS VAN HOUTEN:	I don’t remember. SERGEANT McGANN:	How long did you live there? MISS VAN HOUTEN:	I lived there about — hum (Unintelligible) about a month, maybe. You just don’t want to tell me the name of the girl. I mean, I’m not concerned. I really don’t remember her last name. SERGEANT McGANN:	You mean, you just met her up there and lived with her for a short time. SERGEANT McGANN:	A month or so? And — ah — how did you hear about the Ranch, the Spahn Ranch? MISS VAN HOUTEN:	Ah — Well, I didn’t — I didn’t have a job and I didn’t have — ah — anywhere to go. And — ah — some people came over, some friends of hers, and they mentioned it. So, I just thought I’d go back down and check it out, because I really didn’t have anything to do and I knew my stay there wasn’t going to be too much longer. So, I went down there to Spahn’s. SERGEANT McGANN:	Are you from San Francisco? SERGEANT McGANN:	And when did you come out here? MISS VAN HOUTEN:	About two years ago. SERGEANT McGANN:	You just left home? MISS VAN HOUTEN:	Tired of it. SERGEANT McGANN:	Tired of home, huh? Is that where you first — ah — went to when you ca- — came to California is San Francisco? MISS VAN HOUTEN:	Ah — the northern area; yeah. MISS VAN HOUTEN:	Oh, I just lived with groups of people and keep house, or whatever needed to be done. Taking the easy way out. SERGEANT McGANN:	Easy way out, huh (Unintelligible) all right. SERGEANT McGANN:	You’re a young girl. You were born in Iowa? SERGEANT McGANN:	What city in Iowa? SERGEANT McGANN:	Waterloo. Waterloo, Iowa. Well, you went down to Spahn Ranch, then, around November of ’68. We’ve got that kind of established, huh? Be the Fall of ’68? Be about a year ago? MISS VAN HOUTEN:	I — I’m trying to think if it’s a ye- — a year or two years. I’m trying to remember how many Falls ago. It’d be one year ago. SERGEANT McGANN:	One year ago. Who did you meet when you went there? MISS VAN HOUTEN:	Ah — Diane. MISS VAN HOUTEN:	Ah — Blustein. SERGEANT McGANN:	Blustein. Diane Blustein. MISS VAN HOUTEN:	Ah — Charlie. MISS VAN HOUTEN:	Hum — Mostly the people that were — ah I was arrested with. SERGEANT McGANN:	At Spahn and at Barker, huh? SERGEANT McGANN:	The whole — Almost the whole group was there, then, huh? Off and on, people would come and go, come and go. But, it was like the same faces that would come and go. SERGEANT McGANN:	What were you told up in San Francisco as to what you — to expect up at the Ranch, at Spahn, when you got there, if anything? MISS VAN HOUTEN:	Ah — just a group of people that lived on a ranch, an old western ranch, and kept it going for an old man. So, I figured it was a pretty good deal cause — ah — San Francisco was horrible. SERGEANT McGANN:	What was the problem in San Francisco? MISS VAN HOUTEN:	Oh — Shoosh — Filth. SERGEANT McGANN:	It was filthy, huh? SERGEANT McGANN:	When you say “we”, did you go down with anyone? MISS VAN HOUTEN:	No. Huh-huh. SERGEANT McGANN:	How’d you get down here? MISS VAN HOUTEN:	I hitchhiked. It’s pretty easy to get one ride from San Francisco to L. A. MISS VAN HOUTEN:	At least, it was (Unintelligible) for a while. SERGEANT McGANN:	So, anyway, you arrive down to the Ranch. And what happened when you got there? What was the — What were you to do? What — what was your duties there? MISS VAN HOUTEN:	Oh, I cooked and cleaned up. I didn’t really do too much. SERGEANT McGANN:	So, then, the girls were kind of just — ah — more or less girl friends for all of the guys who were there. MISS VAN HOUTEN:	— much going on. Well, apparently, Charlie and — ah — Tex — He was there when you got there, was he? MISS VAN HOUTEN:	Ah — I really don’t remember if he was there or not. SERGEANT McGANN:	When do you first remember him showing up at the place? MISS VAN HOUTEN:	I didn’t really meet him until about — hum — hum — maybe Christmas. SERGEANT McGANN:	Not too long after you arrived, then, at the Ranch? And how did he arrive? How did he — come about that he arrived there? MISS VAN HOUTEN:	I don’t — I don’t remember. SERGEANT McGANN:	You just remember him being there, huh? I just remember I saw him there. What other men were there that you remember when you got there? All of the guys that were there are gone. SERGEANT McGANN:	Was Clem there? SERGEANT McGANN:	He was there when you got there? SERGEANT McGANN:	How about Bruce Davis? Was he there when you got there? SERGEANT McGANN:	When did he come around? MISS VAN HOUTEN:	Oh, not until — hum — probably Summer. SERGEANT McGANN:	During the Summer, he showed up, huh? What part of the Summer? SERGEANT McGANN:	Towards the beginning of the Summer. That’s be ’69. Summer of ’69 of this year. MISS VAN HOUTEN:	I’m pretty sure. MISS VAN HOUTEN:	He would come and go. In fact, I don’t really ever remember him actually living there. SERGEANT McGANN:	When did you first see him? MISS VAN HOUTEN:	When did I first (Unintelligible) him. MISS VAN HOUTEN:	Probably around early Spring — early Spring. I thought there was a motorcycle club that came up there, too, during the Summer of this year. SERGEANT McGANN:	What were — what were their names, any ones that you remember? MISS VAN HOUTEN:	I don’t remember none of the names, but I remember it was — ah — Straight Satans. SERGEANT McGANN:	That was the name of the group? There was a lot of weapons up there, a lot of guns and a lot of knives and stuff. And the girls were to hide these weapons and, more or less, take charge of some of the weapons, not all of the weapons. Some of them were in an arsenal and some of them were taken by the girls. Apparently, the ones that they used in crimes and such would be taken down to some place and buried by the girls. Is that pretty much right? MISS VAN HOUTEN:	I didn’t know about any weapons. SERGEANT McGANN:	You never did any of that? MISS VAN HOUTEN:	No way. What weapons up there can you tell me about? I don’t remember — you know — names of rifles and stuff like that. Whew — One time, there was about six rifles. SERGEANT McGANN:	What about handguns? There were some handguns, weren’t there? MISS VAN HOUTEN:	Ah — I don’t remember seeing any. See, in the — in the bunk house, they had a rack. MISS VAN HOUTEN:	There were about six rifles there. Well, Charlie had a handgun that’s been described to me — people seeing it and such. Do you remember that handgun that he practiced with? But, I remember — ah — one time, a couple of Straight Satans came over and they brought over guns. And I remember they were all standing out there and shooting. SERGEANT McGANN:	Well, what did the — what did the guns look like that you saw? SERGEANT McGANN:	Well, you’re describing the gun — of a barrel. All in all, it was probably about like that. SERGEANT McGANN:	About twelve inches, huh? This is the gun he used to fire, Charlie? MISS VAN HOUTEN:	I don’t know. I didn’t pay too much attention. What can you tell me about the knives? What kind of knives did they have? They’ve got a big variety of knives. SERGEANT McGANN:	This would be at Spahn Ranch. In other words, they were not (Unintelligible) some of the girls went out with credit cards and bought — bought a whole bunch of pretty good knives — some real good knives. They were expensive knives they bought with stolen credit cards. Were you one of the girls that went out and bought the knives? MISS VAN HOUTEN:	Ah — I don’t — I don’t know. See, for about three weeks, I was sort of laid up. SERGEANT McGANN:	Well, what for? Why? I had a black widow bite on my knee. SERGEANT McGANN:	Oh, you did, huh? MISS VAN HOUTEN:	And I — you know — I didn’t go to a doctor. So, for about three weeks, I was just sort of out. SERGEANT McGANN:	When was that? SERGEANT McGANN:	Middle of July until the beginning of August, huh? MISS VAN HOUTEN:	Around in there. For about four days, I was completely out. I’d wake up just enough to go to the restroom and I’d black out again. MISS VAN HOUTEN:	And then — ah — all the rest of the time, I had to stay in bed. So, I really don’t know too much of what was going on. MISS VAN HOUTEN:	So, I really don’t know. I don’t really remember. But, the knives, there were all kinds of them. Some with ivory handles — you know — some with (Unintelligible) around them. There were some with blades that went this way, and some with blades that went straight up — all kinds. SERGEANT McGANN:	All kinds of knives, huh? Do you have any idea (Unintelligible) what a clasp knife is? The one I’m referring to is larger than the normal pocketknife. In total length, it would be about maybe ten inches, with a blade of maybe four or five, and the handle four or five inches. And it would fold up. Do you (Unintelligible) do you recall seeing a knife like that up there? MISS VAN HOUTEN:	There was one — really big one. MISS VAN HOUTEN:	(Unintelligible) pull it out. MISS VAN HOUTEN:	Hum — I don’t remember. I don’t think anybody really ever claimed anything as — you know — theirs. SERGEANT McGANN:	But, you recall seeing one of those, something like I’ve described to you? SERGEANT McGANN:	How about bayonets? MISS VAN HOUTEN:	You mean, guns with the thing that sticks up on it? SERGEANT McGANN:	Yeah, the bayonet sticks on the end of the rifle. I don’t know if you know the difference between just a– I think you would know the difference between a — ah — a bayonet and just a regular hunting knife, because there is a difference. In other words, the blade is, more or less, straight. It would probably be somewhere between — between ten and fifteen inches long. This would be the blade length. Then, of course, there would be a grip on that or a handle. Do you remember seeing any of those up there? MISS VAN HOUTEN:	There could have been one. SERGEANT McGANN:	Well, I think there were more than that. Supposedly, they brought about three or four of them right down from the Spahn Ranch. I don’t recall seeing three or four of them. Do you recall seeing one? MISS VAN HOUTEN:	I might have seen one go by. I didn’t really — you know — size up all of them. They sharpened most of the knives, most of the regular knives. Did you participate in that? Did you sharpen some of the knives up there (Unintelligible) edge (Unintelligible) the guys told you how to do it and you — you did it. You did this part — sharpening. Did you take part in the sharpening of the knives? SERGEANT McGANN:	Well, you ruined them, huh? MISS VAN HOUTEN:	I was making them dull. SERGEANT McGANN:	You were making them duller, huh? What kind of knives were you sharpening? MISS VAN HOUTEN:	Just the regular ones. SERGEANT McGANN:	Just — One of the hunting knives, huh? SERGEANT McGANN:	Was this one of the ones with the black handles that they got with the stolen credit cards? MISS VAN HOUTEN:	It could have had a black handle. Most of the ones I’ve seen had the black handles on them. MISS VAN HOUTEN:	You’ve probably seen more than I have. SERGEANT McGANN:	Well, let’s say you held your own anyway. MISS VAN HOUTEN:	Enough to be happy. MISS VAN HOUTEN:	But you’ve also got to look at it this way: If — if, like you say, he did do some brainwashing, then that means that it’s going to take a while to undo what he did. SERGEANT McGANN:	(Unintelligible) but, still, it’s wrong. It still is wrong. MISS VAN HOUTEN:	‘Cause he sounded pretty convincing to me. I can even look back on it now and — and see how, you know, it was. SERGEANT McGANN:	But you think he lied to you a little bit? MISS VAN HOUTEN:	Uh huh. SERGEANT McGANN:	Okay, Leslie, I think he did. He wasn’t the man that he said he was, I don’t think. And he used people. MISS VAN HOUTEN:	His final goals don’t matter much from the way it sounds. SERGEANT McGANN:	No. They don’t. They really don’t. But when he kills people like that and does things with absolutely no cause, there’s something wrong. And the people that went along, there’s something wrong with them, too. Maybe they need help. Maybe they’re sick. I don’t know. Maybe they need help. Maybe they are not sick. Maybe they’re just mean and onery. SERGEANT McGANN:	Well, I’m — I’m saying that maybe he thought he was doing the right things. He was killing pigs, the middle class white person. Apparently, this was his philosophy, to kill the middle class white people and upper class of white people, I suppose. I don’t know where he drew the line. MISS VAN HOUTEN:	That’s cold-blooded. SERGEANT McGANN:	Sure is. But that’s what he wanted to do. It’s not right either. It just isn’t right and I don’t think you think it’s right either, down deep in your own mind and in your own heart. MISS VAN HOUTEN:	Do you read my mind? SERGEANT McGANN:	Well, I’m not sure. MISS VAN HOUTEN:	What do you think it’s saying? MISS VAN HOUTEN:	But at least a nice turkey dinner at home with your family. MISS VAN HOUTEN:	Four months. SERGEANT McGANN:	Four months. I haven’t had a vacation. My vacation was cancelled. MISS VAN HOUTEN:	Well, you’ll get a longer one. SERGEANT McGANN:	I needed one then. SERGEANT McGANN:	After a month on this case, I — after the first month, I needed one. But that’s — that’s neither here nor there. MISS VAN HOUTEN:	Well, it’s looking pretty good for you (Unintelligible) coming to an end. SERGEANT McGANN:	I hope so. I certainly hope so. MISS VAN HOUTEN:	Well, you told me that you got just about everything. SERGEANT McGANN:	Oh, we got a lot, but we need more. We need more. A good detective never rests his case until he’s got everything. MISS VAN HOUTEN:	You wouldn’t settle for one? SERGEANT McGANN:	No way. We’d settle for two. We’ve got two now. MISS VAN HOUTEN:	Did the girl get immunity? MISS VAN HOUTEN:	She didn’t? SERGEANT McGANN:	I think so. Yeah. MISS VAN HOUTEN:	You do? SERGEANT McGANN:	I know so. I can’t tell you how I know, but I know she’s telling the truth. MISS VAN HOUTEN:	Okay. Well, I mean — I don’t care. Well, I’d tell you if I could, Leslie. I really would. MISS VAN HOUTEN:	I don’t want to know nothing anymore. I don’t care. SERGEANT McGANN:	Well, you know some things, Leslie. MISS VAN HOUTEN:	Oh. I’m forgetting. SERGEANT McGANN:	No. I don’t want you to forget. I want you to (Unintelligible) Why don’t you tell me? MISS VAN HOUTEN:	I honestly don’t know what happened in that house. SERGEANT McGANN:	You know who went out there, though. That’s what’s important to me right now. MISS VAN HOUTEN:	Well, the more I try to remember it, the more I forget. SERGEANT McGANN:	Well, no (Unintelligible) that’s not right either; that’s not true now. Let’s be honest with each other. Huh. SERGEANT McGANN:	Let’s be honest with each other. You do know who went up there that night. You know some of the facts, too, as to what happened. MISS VAN HOUTEN:	How come I have to know? Because you know. That’s why. MISS VAN HOUTEN:	Even if I tell you I know that Charlie didn’t go, then that means I wasn’t telling you the truth. SERGEANT McGANN:	I think you are really trying to protect Charlie. Maybe you’re trying to protect him for that reason. I don’t know if that’s it or not. That’s — My crystal ball tells me that might be it. I know that Charlie was there and I (Unintelligible) one of the girls was there. I got (Unintelligible) that it could be Marnie Reeves. I don’t know. You know. You know who the other girl was and who the guy was. MISS VAN HOUTEN:	It could be. It could be, but I couldn’t say for sure. I’d like to tell you that it could be, but I couldn’t tell you for sure. It could be because I’m not sure. SERGEANT McGANN:	You can say for sure it was because I — you know you can. MISS VAN HOUTEN:	You’ve got a lot of patience. SERGEANT McGANN:	Well, you’ve got to have patience sometimes. I think — ah — I think you know what I’ve been telling you is the truth. MISS VAN HOUTEN:	Well, if it is, it’ll start sinking in. SERGEANT McGANN:	All right. That fair enough. MISS VAN HOUTEN:	What do you mean, you’ll help me? SERGEANT McGANN:	Well, I’m trying to help you get squared — If you want to get helped — if you want to go — I mean, whatever you want to do, I’ll try to help you with whatever you want to do. MISS VAN HOUTEN:	You mean if I (Unintelligible) to get out of here? MISS VAN HOUTEN:	I know what I have to do when I get out of here. I’ll have to buy — ah — a wig with greying hair it and get a pair of glasses and walk around like a librarian for the next ten years. SERGEANT McGANN:	No, you wouldn’t, Leslie. You really wouldn’t. SERGEANT McGANN:	Well, we’ll — we’ll wrap it up. But, we’ve got to have — we’ve got to know everything about everybody before we can wrap it up completely. I guess that was the one I was thinking about. It slipped my mind when I talked to you. Well, I guess it was a little while ago we talked about it. SERGEANT McGANN:	Well anyway, he’s dead. But if we get them all wrapped up, no problem. You don’t have to worry. And then again (Unintelligible) I’ll help you when you get out. I’ll do what I can. Whatever you want to do or try to do I can help you with. That’s true. SERGEANT McGANN:	I’m not, you know, shooting you a line of baloney or anything. MISS VAN HOUTEN:	Yeah, a little. I — I drank a lot of coffee today — about seven cups. SERGEANT McGANN:	Do you have that card I gave you? MISS VAN HOUTEN:	Umhum. Got it here in my pocket. SERGEANT McGANN:	Uh huh. Detective Headquarters Division. See, our office is closed normally at night. SERGEANT McGANN:	Tell them you would like to talk to (Unintelligible) Okay? SERGEANT McGANN:	Will you do that for me? I mean, if — if you decide tonight or anytime tonight or anytime tomorrow or anytime tomorrow night. MISS VAN HOUTEN:	It won’t be anytime tomorrow or tomorrow night (Unintelligible) you’ll have a nice Thanksgiving. MISS VAN HOUTEN:	Okay, if you want to. MISS VAN HOUTEN:	Oh, I’d love one. I almost forgot what I look like. UNIDENTIFIED VOICE:	(Unintelligible) said I had it. MISS VAN HOUTEN:	(Unintelligible) Dave. SERGEANT McGANN:	What’s his last name? MISS VAN HOUTEN:	I didn’t know their last names. SERGEANT McGANN:	Do you know (Unintelligible) last name? MISS VAN HOUTEN:	If I recall, I’m pretty sure Dave left a long time ago. MISS VAN HOUTEN:	Well — But, of anybody, I’d suspect him. MISS VAN HOUTEN:	That’s one person you wouldn’t mess with for a second. SERGEANT McGANN:	I’m not convinced that there was a man on the deal, anymore. other than Charlie. I’ve got some additional information. I’m not positive there was another man there. There may have been. There may just have been three girls and Charlie. MISS VAN HOUTEN:	But how many men were murdered there? MISS VAN HOUTEN:	Two men and three women? SERGEANT McGANN:	Oh, three men — three men and two women (Unintelligible) with the gun, which Charlie had. You know, he was ten feet tall with the gun. MISS VAN HOUTEN:	Well, did it look like they had lined them all up? MISS VAN HOUTEN:	It seems like one of them could take the gun away then. SERGEANT McGANN: Nobody is going to fight against a gun. If they realize they’re going to get killed no matter what happens, then they might run, which they did run, and then they got shot when they ran. You know that. I’m sure you heard all about it. MISS VAN HOUTEN:	Honest, I didn’t. SERGEANT McGANN:	Oh, Leslie. I think you did. You remember what I talked about the other night about the guns and — and Charlie firing the gun up there at the ranch and with all those other guys too. SERGEANT McGANN:	If I show it to you will you tell me one or the other if — if you ever saw Charlie fire a gun that looked like that one, when I show you, even though other guys fired it, too. Will you? MISS VAN HOUTEN:	Huh huh. MISS VAN HOUTEN:	I can tell you that I know that the gun was at the ranch because you said it had a long barrel. Right? SERGEANT McGANN:	Well, it’s not one you put together? You don’t put it together? SERGEANT McGANN:	It’s a pistol and it’s long. MISS VAN HOUTEN:	But the barrel sticks out about six inches longer, it looked like, than a normal one. MISS VAN HOUTEN:	I saw a gun up there. SERGEANT McGANN:	Charlie used to fire it out there. In fact, it really was his personal weapon, because he carried it around with him, and had people that saw him carry it around with him. Some people saw him shoot it. All I want you to do is look at it and see if you saw him shoot the weapon out there. MISS VAN HOUTEN:	What good would that do? SERGEANT McGANN:	Well, it shows one point — that he did shoot the gun. MISS VAN HOUTEN:	But, you already know that he shot it. SERGEANT McGANN:	Well, I think he did. MISS VAN HOUTEN:	Oh, you think he did? MISS VAN HOUTEN:	Now, I couldn’t say for sure. SERGEANT McGANN:	You could say you saw him or didn’t see him. MISS VAN HOUTEN:	Possibly. But I’m not. I don’t think I would like to do that. That sounds too serious — I mean — you know. SERGEANT McGANN:	Well, I am serious. I’m deadly serious. SERGEANT McGANN:	I’m here because I’m serious. Five people were killed and they shouldn’t have been killed with no reason. And then, there were two people the following night killed that shouldn’t have got killed. And it was done in a horrible way. SERGEANT McGANN:	Well, it didn’t make any difference how it was done. It was done in a horrible way, but it doesn’t make any difference, regardless of how it was done. MISS VAN HOUTEN:	One girl told me that one of the guys had a black hood on his head. Did he? SERGEANT McGANN:	No. Who told you that? SERGEANT McGANN:	One of the girls here? SERGEANT McGANN:	How did they know? Has somebody been telling them things? SERGEANT McGANN:	Oh, it’s okay. Listen, I — I’ve brought a little piece of cake in here for Leslie. Is — is that going to be against the rules? I’ll hide it if it is. Okay, okay, okay. All — all right. Thanks. MISS VAN HOUTEN:	Should we go? Should I leave? SERGEANT McGANN:	How are you? MISS VAN HOUTEN:	(Unintelligible) you know. It was just a term that was used. SERGEANT McGANN:	Yeah. But, of — of course the middle class person, I know they’re called pigs, but not — in addition to the police, didn’t they? I mean, they just didn’t just (Unintelligible) they called middle class America pigs, didn’t they? SERGEANT McGANN:	That puts a lot of people under the name of pigs. MISS VAN HOUTEN:	Probably just — ah — the whole entire population of the United States. SERGEANT McGANN:	It didn’t include you — you guys up there, apparently. You — you came from probably a middle class family, didn’t you? SERGEANT McGANN:	So that included you too, really,and your parents. SERGEANT McGANN:	Do you have any brothers and sister? MISS VAN HOUTEN:	Hu hu. They could be maybe after me. SERGEANT McGANN:	Well, you knew — you knew. They talked freely in front of you, Leslie, and you know what they said. Charlie might think you’re a dummy, but I don’t. MISS VAN HOUTEN:	(Unintelligible) I keep eating it and I’m really very full. MISS VAN HOUTEN:	I’m trying to figure this out. MISS VAN HOUTEN:	I’ve got it. Do you know what happened at Sadie’s Court appearance? SERGEANT McGANN:	(Unintelligible) it was just for arraignment. In other words, they set a — set a time and date for the trial. SERGEANT McGANN:	That’s all they did. MISS VAN HOUTEN:	Was hers a private one too, or was it open to the public? SERGEANT McGANN:	(Unintelligible) open to the public. MISS VAN HOUTEN:	I think the only public that would want to go see it are all in jail. SERGEANT McGANN:	That’s more than likely true. MISS VAN HOUTEN:	Have you seen Bobby Beausoleil? No. I’ve seen him. I haven’t talked to him. MISS VAN HOUTEN:	You’ve seen him though? Is he doing pretty good? SERGEANT McGANN:	I guess so. MISS VAN HOUTEN:	Can’t I just tell you that I’m not going to tell you who was there. SERGEANT McGANN:	I don’t think you want to do that. I think you want to tell me who was there. MISS VAN HOUTEN:	If I’d wanted to, I would. SERGEANT McGANN:	Well, I’m waiting. I’m giving you the opportunity. You do want to tell me. MISS VAN HOUTEN:	I do? SERGEANT McGANN:	And you know who they were. MISS VAN HOUTEN:	No. Mine would be a guess. SERGEANT McGANN:	No, it wouldn’t be a guess. It would be a pretty educated guess as to who you heard was there. And that’s all I wanted to know. You know what I want to know. MISS VAN HOUTEN:	— but I don’t want to tell. SERGEANT McGANN:	— and you know. Well — but why don’t you want to tell me? MISS VAN HOUTEN:	Because I don’t know for sure. SERGEANT McGANN:	Well, what did you hear. That’s all.What did you hear around the campfire or wherever you happened to be — in the trailer or in the (Unintelligible) or wherever you were? MISS VAN HOUTEN:	I heard that it had happened. SERGEANT McGANN:	(Unintelligible) you heard — you heard the people that did it, Leslie. You know who did it. MISS VAN HOUTEN:	How could I know who did it if — if I wasn’t there? SERGEANT McGANN:	Well, you heard who did it. They talked freely about it when they got back that night, the next day, and for days following. MISS VAN HOUTEN:	And they only talked freely about it with me? SERGEANT McGANN:	No. And they talked about it freely with other people, too. MISS VAN HOUTEN:	Have you asked them? MISS VAN HOUTEN:	I’m not going to say nothing. SERGEANT McGANN:	Are you still protecting Charlie? SERGEANT McGANN:	You are still protecting Charlie. MISS VAN HOUTEN:	I could swear on a stack of Bibles that he wasn’t there, to my knowledge. SERGEANT McGANN:	Charlie’s your father image and why, I don’t know. How you could possibly want a — ah– cold-blooded killer as your father image, I’ll never know. He’s a killer. You know he’s a killer. He’s a vicious cold-blooded killer. In addition, he kills for nothing no reason. He’s worse than an animal. An animal at least kills for food. He didn’t eat the people up there. Is that the kind of father image you want? SERGEANT McGANN:	Well, why then are you taking his doctrine, or following his doctrine? MISS VAN HOUTEN:	I don’t know for sure that he was there. What did you hear? What did you hear sitting around the campfire up there about that? Everyone whose name that was mentioned, okay, you don’t have positive knowledge. You didn’t see them commit these acts. What did you hear (Unintelligible) as to who was there. You heard, Leslie. You know you did. You saw Charlie shoot this gun, this particular gun I’m telling you about, up there at the ranch. MISS VAN HOUTEN:	I didn’t know that. SERGEANT McGANN:	— along with a lot of bayonets that they used to do the actual stabbings. MISS VAN HOUTEN:	See, you’re telling me things that I didn’t know. SERGEANT McGANN:	You knew they — who went on the murders though, because they told you. They told you how they killed them and the whole thing. At least, they told you they killed them. They told you they got five “piggies”. MISS VAN HOUTEN:	Well, the first I heard about it was on the TV. SERGEANT McGANN:	Well, you were taking care of one of the girl’s babies, Zezo to say that they saw it because I — I’m not saying anything. Now, Leslie, look, I know you did see it, though. And you are credible. MISS VAN HOUTEN:	You mean I’m good (Unintelligible)? SERGEANT McGANN:	No. I mean you’re honest. You were there and you saw this. MISS VAN HOUTEN:	What’d I see? SERGEANT McGANN:	You saw him firing this gun. Sadie’s already told fifteen people in this jailhouse that she was there; she took part in it and everything else. MISS VAN HOUTEN:	Didn’t she mention anybody else? SERGEANT McGANN:	No, she didn’t, except for Charlie and Katie. MISS VAN HOUTEN:	She mentioned Charlie and Katie? MISS VAN HOUTEN:	And herself? MISS VAN HOUTEN:	And nobody else? MISS VAN HOUTEN:	Well, that was pretty (Unintelligible) of her. SERGEANT McGANN:	Sure was, wasn’t it? MISS VAN HOUTEN:	That right there should be enough for you. SERGEANT McGANN:	Not enough. There’s more people involved. MISS VAN HOUTEN:	More what? SERGEANT McGANN:	There were more people involved. At least one more girl and maybe one more guy, and we need to know who they were. You know if there was another girl or if there was another guy. I’m sure there was one more girl, but I’m not sure there’s one more guy. You also saw Charlie shoot this gun up there. Do you want them on the streets again? MISS VAN HOUTEN:	Oh, no. So actually, all you want is the name of one more girl. SERGEANT McGANN:	Yeah. And a guy if he was there, if another guy was there. That’s right. MISS VAN HOUTEN:	Seems like if Sadie was going to talk so freely, she would have mentioned everybody. SERGEANT McGANN:	Well, I’m sorry. I wish she would but she didn’t. MISS VAN HOUTEN:	That’s incredible. SERGEANT McGANN:	Well, I’m, I’m sorry. That’s the truth. I’m not I’m not lying to you. MISS VAN HOUTEN:	You know, I — It doesn’t matter to me if you were or not. SERGEANT McGANN:	Well, I’m not. You know I’m not. Getting down to the nitty gritty. The Family is no longer in being way it was. She had no — no hesitation about talking about it to everybody in the jail here. I know darn good and well she talked to you. MISS VAN HOUTEN:	Did she tell people that in the jail too? SERGEANT McGANN:	She sure as hell did. SERGEANT McGANN:	Killed five people (Unintelligible) the one. Me, number one, and she said, “And I went out the next night and killed two more,” you know, the ones up in the hills. MISS VAN HOUTEN:	Sadie said she did that? SERGEANT McGANN:	That’s right. Sadie Mae Glutz, aka Susan Atkins. MISS VAN HOUTEN:	What is AKA? SERGEANT McGANN:	Also known as. MISS VAN HOUTEN:	Hum. She sort of wrote out her own — ah — ticket. It’s funny how they’ll let you — they’ll let you sit everything out. They’ll let you sit the whole works out and you can sit up there for twenty years if you want to for the next — your natural life. If that’s what you want, Leslie, that’s fine and dandy, but I don’t really think you want that. You’re no dummy. When you get down to the nitty gritty, that old Family jazz goes right out the window. MISS VAN HOUTEN:	I believe you and I don’t see how it could possibly get back together if everyone’s doing all that stuff. But I have nothing to say. It sounds like you’ve got it pretty well wrapped up. SERGEANT McGANN:	No. I don’t have it wrapped up yet. I don’t know who the rest of the people are. That what I need you to tell me. I need to know if you saw Charlie shooting a certain gun and I need to know where the weapons are buried that were used. MISS VAN HOUTEN:	Well, I don’t know where the weapons are, honest. SERGEANT McGANN:	You’re in that type of situation now. MISS VAN HOUTEN:	Yeah, I know it but still I don’t want to be in that type — I — I don’t want to look at it. And I — And I’ll tell you that from what I’ve heard, you guys don’t have the other girl that was there. SERGEANT McGANN:	Well, are you speaking of Marnie, now? We don’t have her in custody yet, but we know who she is. MISS VAN HOUTEN:	Well, I’m not talking about Marnie. SERGEANT McGANN:	You’re not talking about Marnie. Were you leveling the other night when you told me that Linda, the new girl, was the other one or were you spoofing me? MISS VAN HOUTEN:	Hum. I don’t know ▪ for sure. SERGEANT McGANN:	What did you hear? MISS VAN HOUTEN:	I heard that there was another girl. SERGEANT McGANN:	What’s her name? MISS VAN HOUTEN:	I was spoofing you. SERGEANT McGANN:	Hum? What’s her name? Is it Linda? SERGEANT McGANN:	Who was the other one that you heard was up there? MISS VAN HOUTEN:	How’d you know there were three girls and one guy? SERGEANT McGANN:	(Unintelligible) Sadie said. MISS VAN HOUTEN:	Three girls and one guy. SERGEANT McGANN:	Well, she said three girls and Charlie. Who was the other girl? You know. Huh? Who was it? MISS VAN HOUTEN:	Can’t you ask Sadie? MISS VAN HOUTEN:	Why can’t you? SERGEANT McGANN:	Because I can’t talk to her. MISS VAN HOUTEN:	Oh, her lawyer won’t let you? SERGEANT McGANN:	Because of the rules of evidence. SERGEANT McGANN:	She’s being represented by an attorney. MISS VAN HOUTEN:	When do I get to be represented by an attorney? SERGEANT McGANN:	You weren’t there. SERGEANT McGANN:	Who was the other girl? MISS VAN HOUTEN:	I’m not going to tell you. SERGEANT McGANN:	You know who it was, Leslie. You know who it was and I can’t for the life of me see why you want to protect a bunch of killers. Why do you? MISS VAN HOUTEN:	I’m protecting myself. SERGEANT McGANN:	You’re not protecting yourself. You weren’t there. MISS VAN HOUTEN:	I know I wasn’t there, but I’m protecting my — I see it as I’m protecting myself. SERGEANT McGANN:	How do you see that? MISS VAN HOUTEN:	Because, if Zero was suddenly found playing Russian Roulette, I could be found playing Russian Roulette. SERGEANT McGANN:	You aren’t going to be found playing Russian Roulette. We’ll give you twenty-four hour protection go out Scot free. That’s the truth. I do need you. I have — I have other things I could be doing now important to the case but I think this is more important right now. MISS VAN HOUTEN:	Well, I’m not going to tell you so why don’t you go do your other things. SERGEANT McGANN:	No. You are going to tell me, I think. I think you want to tell me. MISS VAN HOUTEN:	Not today. SERGEANT McGANN:	When are you going to tell me, tomorrow? MISS VAN HOUTEN:	No. I’m not going to. MISS VAN HOUTEN:	Because I don’t know. SERGEANT McGANN:	You do know. You were there. After the thing happened, you heard them talk about it. You know who was there. You are carrying all the weight on your shoulders. MISS VAN HOUTEN:	Uh uh. SERGEANT McGANN:	Yes, you are. You’re carrying all those other people’s worlds on your shoulders too. It’s ridiculous. Charlie doesn’t give two hoots about the people that were up there. They were a means to an end with Charlie. And you were part of that means. You’re no dummy. You could see that. He used people. You, yourself, said you went over with this — What is it? The Satans? You went with that bike group. SERGEANT McGANN:	Well, you, yourself, said you went over there and (Unintelligible) of the Family for awhile. You didn’t need the Family. SERGEANT McGANN: Do you think you’re doing the right thing? SERGEANT McGANN:	Well, what do you think? MISS VAN HOUTEN:	I think you’d better go work on your other things, because I’m not — I’m not budging. SERGEANT McGANN:	You think these people ought to get away with killing all these people, huh? SERGEANT McGANN:	Can’t do it. MISS VAN HOUTEN:	The whole thing rests on my shoulders. SERGEANT McGANN:	The other people do. MISS VAN HOUTEN:	That would amount to one girl. SERGEANT McGANN:	Oh, there’s some other people too. We need more than one. We have some now. MISS VAN HOUTEN:	Some what? SERGEANT McGANN:	Some people to testify they heard things. SERGEANT McGANN:	But you just can’t have one or two. We need more than one or two. SERGEANT McGANN:	You know, if you want to ride all your beefs alone, that’s your business, but I think you’re being very foolish to do it. MISS VAN HOUTEN:	Then, I’m a fool. SERGEANT McGANN:	Hum — whatever’s right, I guess. SERGEANT McGANN:	I’m going to give you some time to think about it. I’ll come back and talk to you later. SERGEANT McGANN:	Either today, tomorrow or Sunday. I hope you find some stuff without me. because I’m (Unintelligible) is it all right if I take these?